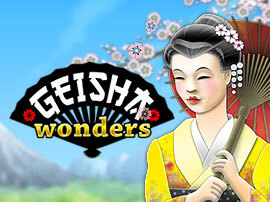 Geisha Wonders is a 5-reel, 30-line video slots game created in the modern Vegas slots style. 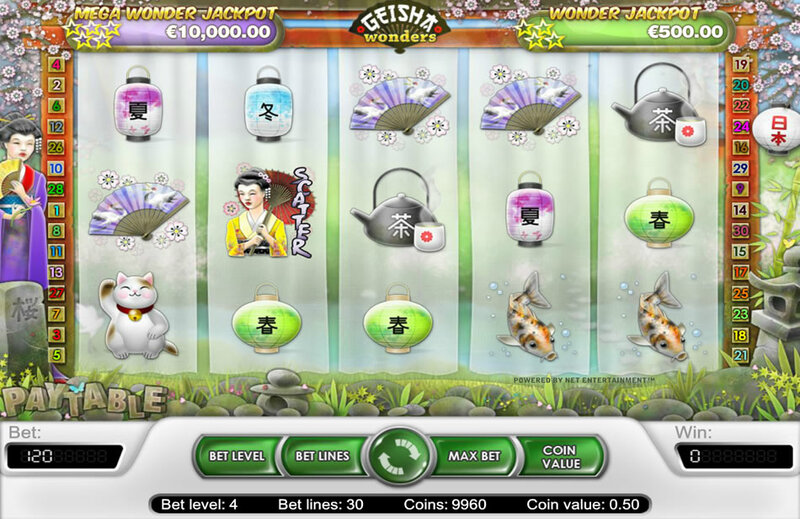 NetEnt is known for creating some truly impressive slot games, and Geisha Wonders in particular is a game that impresses with attention to detail. A geisha theme could easily be crass, but this game is a work of art that honors the tradition rather than the oft-erroneous Western perception. Most NetEnt games are free online slots, which is the case here as well. 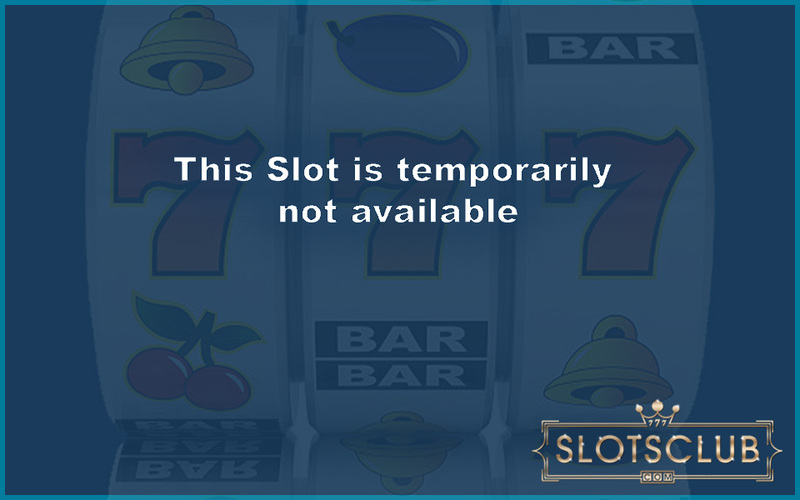 That means that you can experience the slot machine as much as you like without having to risk any real money. If you choose to play for real, you can play for as little as 0.01 coins. The machine lets you choose between one to 30 bet lines, a bet level between one to four and a coin value that ranges from 0.01 to 0.50 coins. 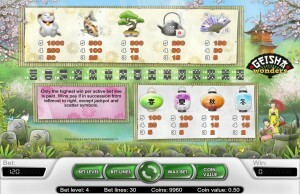 Therefore, the maximum bet per spin is 60 coins, and the minimum amount needed to activate all lines is 0.30 coins. Bet level simply acts as a multiplier to your wager and any winnings earned from it. The goal with the theme used here is to celebrate Japan’s geisha tradition, and the developers incorporate various elements of Japanese tradition in general as well. The color and art choices are directly influenced by the art style used to decorate Japanese paper lanterns and kimono fans, and that helps to set an effective atmosphere that’s enhanced through careful choice of music and sound effects. The game’s two most important symbols are a geisha holding a fan and a stone statue of a monk. Other symbols in the set include kitten jars, koi fish, bonsai trees, tea kettles, cups and kimono fans. In place of traditional poker symbols, NetEnt uses paper lanterns in various colors: green, purple, orange and blue. The stone monk statue serves as the jackpot symbol, which awards 10,000 coins with five across. It also dual serves as a wild symbol that can substitute for any non-scatter symbol. The geisha serves as the scatter and provides two features that can both activate in a single spin. With two or more symbols present anywhere on the reels, the scatter pays out the total wager multiplied by 2, 4, 50 or 400. In addition, with three or more scatters anywhere on the reels, the game awards 10, 20 or 30 free spins. 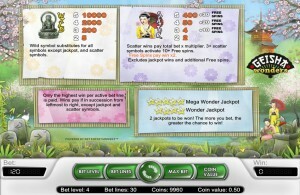 Free spins include a x2 multiplier. That multiplier doesn’t apply to jackpots, and it doesn’t stack if additional free spins are won during a free spin. 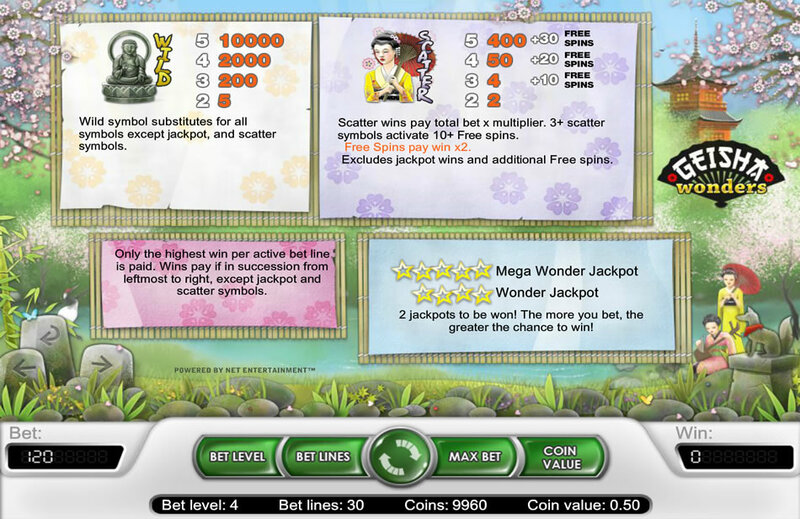 Finally, Geisha Wonders has two progressive jackpots: Wonder Jackpot and Mega Wonder Jackpot. These are awarded randomly and can happen on any spin, and which pot you win depends on the overall size of your bet that particular spin. 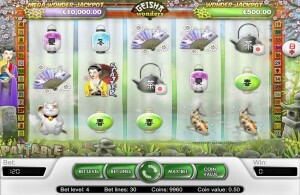 Geisha Wonders, which is available at SlotsClub.com and other online casinos that host NetEnt games, stands out because it’s different than a lot of the other slot games Net Entertainment creates. Rather than 3D graphics and complex animations, the developers have opted for very flat 2D graphics and muted colors. That helps create an incredibly unique aesthetic that goes well with the Japanese motif. The game is also simple compared to many other NetEnt slots but that too is refreshing. The game pays out well, is easy to understand and features a top progressive pot that is no smaller than 10,000 coins and can grow considerably larger than that. Another nice aspect of Geisha Wonders is that it plays very fast, faster than most NetEnt games, and that’s in large part due to a neat blur effect used on the reels.